It’s been a while since I have been here. Life has gotten quite a bit hectic and it is taking me WAY too long to get through books lately. I also have been caught up in the #100dayproject, which you can catch in more details on my instagram. Let’s get back to the real reason you are here. 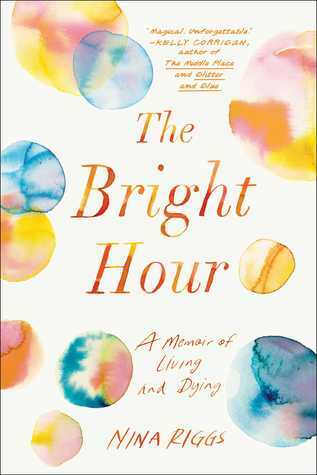 Today’s post is about The Bright Hour by Nina Riggs. Last year when the Paper&Glam book club read When Breath becomes Air and the members found out that the 2 spouses of the authors were now dating, I knew that at some point I would need to read this book! I was finally able to pick up the book this year, not only that it fulfilled the requirement for the Rachel Dawson’s reading challenge of Memoir. Nina Riggs’ book is written in a series of essays that seem to be written in chronological order and slowly get more introspective as the book progresses. Throughout the book Riggs talks candidly about her dealing with breast cancer, which soon spreads to other parts of her body. She also mentions her conversations with other cancer patients including her mother and her best friend Ginny. Riggs also quotes Ralph Waldo Emerson and other notable writers throughout the book showing off her MFA degree with some air of knowledge, but not in a haughty sense. I loved that Nina Riggs’ is able to talk so candidly about her battle with cancer and share her thoughts on losing her mother during her battle, as well as a few interactions with her doctors and nurses throughout the ordeal. I would definitely recommend this book for its thoughtful introspective nature. I would not recommend this book for people who have recently lost a loved one to cancer or are currently battling cancer. I was in tears toward the end of the book, even though I knew what was going to happen. I also thought that it was sweet that her husband included an end note regarding many of the people we were introduced to throughout the book as to tie the ends together. 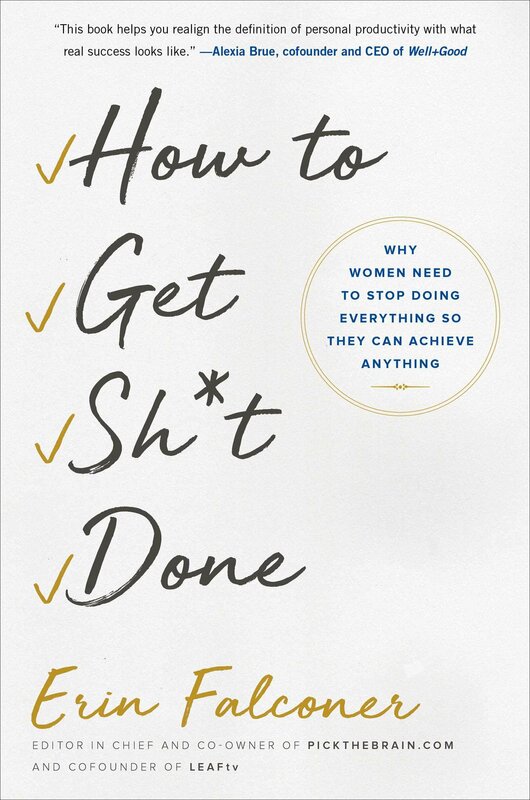 Let me know what you have been reading lately and if you have read this book also. I’m back with yet another book review, but I thought that this one was incredibly fitting. I definitely owe you more diverse posts here and I definitely plan and bringing it in the near future, but that won’t be today’s post. 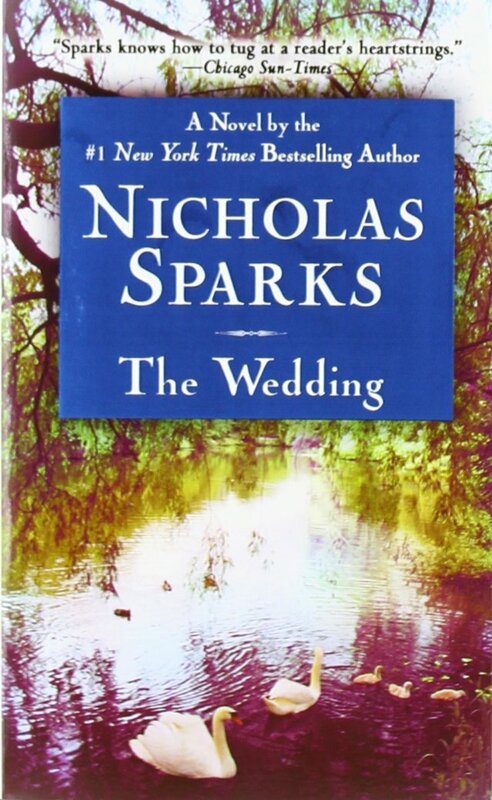 Today we are going to talk about Nicholas’ Sparks The Wedding which is the sequel to The Notebook. This was also the Paper & Glam read for the month of February if you are also participating in that book club. If you loved The Notebook movie you will not like this book as much because it gives you a definite ending to the movie, which was slightly different than the book. In this book, we catch up with Noah Calhoun several years after Allie has died, but he is still continuing to live at Creekside home. We interact with Noah far less than we do in The Notebook, but we still have interactions with him since his love story with Allie is the driving force behind what happens. In the sequel, we meet up with Winston and Jane, a couple who have had a rough couple of years being empty nester, which is only made worse when Winston forgets his wedding anniversary. His wife takes an extended vacation to see their son and makes it clear that she was extremely hurt by his lack of carelessness. Winston spends the majority of the book in the year since trying to put together the ultimate surprise for his wife the following year in order to save their marriage. Since, the book is narrated by Winston it is difficult to know how Jane truly reacted to the changes the Winston made throughout the year and the surprise. I won’t give away the surprise, but if you have read any Nicholas Sparks book you can guess pretty good where this story is headed. Even though, this was my second time reading this book I found myself still cheering for Winston and the little victories that he made in surprising his wife throughout the year. I thought that his trips down memory lane recalling his romance and love story with his wife were especially touching. I also loved the fact the when Winston talked to Noah about his plan and ask for advice Noah didn’t judge him and Winston also didn’t judge Noah for believing certain things and wanting them to be true. I felt that Nicholas Sparks correctly portrayed the plight of the every man in the every day life. We all can’t be Noah Calhoun’s and have beautiful romances like Noah and Allie’s. Noah does admit that he and Allie did fight in the book and not everything he did for her was sweet and beautiful as people might think. I would definitely recommend this book if you are needing a bit of romance in your life and would need to live a bit more time in the world of Noah Calhoun and Allie. I’m back once again with yet another book review. At some point there will be more real life posts, but since I am sort of behind on my reading goal this year I thought that I would try and use the month of March to catch up. It also doesn’t hurt that the Creating & Co book club is also having a readathon month where we attempt to clear books of our book shelves. 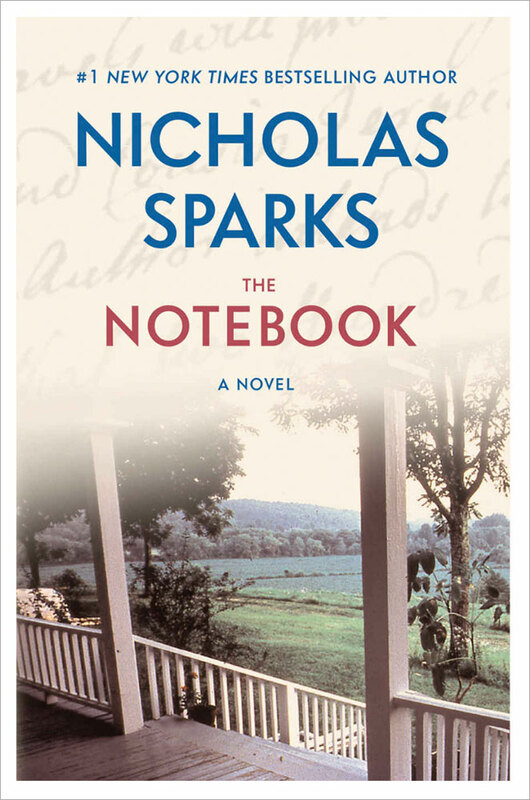 I’m pretty sure that I hadn’t read The Notebook by Nicholas Sparks before though I will admit that I have read quite a bit of his books in the past. I do know that I have read the follow-up to this called The Wedding several years back. I’m glad that the Paper & Glam bookclub made both books their February read and that I got to read both in succession. After reading the book and then watching the movie, which is currently on Netflix. I think that I honestly like the book better. In case you haven’t heard of this book or the movie, here’s a quick synopsis Noah Calhoun and Allie Nelson have a summer romance in the North Carolina town where Noah was raised. Then circumstances beyond their control tear them apart for several years until in 1945 Allie comes unexpectedly back into Noah’s life. Flash forward years later and Noah as an old man is reading their love story to Allie hoping for a miracle that she’ll remember since she has been living with early onset Alzheimer’s disease. I loved the story to pieces, I think what really did it was the way that Noah never gave up on Allie even though her disease affected her memory in such a tremendous way. It takes great patience and perseverance to keep doing something so simple like reading and being with someone like that everyday. This is the love story that people hope for and this is a classic Nicholas Sparks book that has made him the romance author of this time. Let me know if you have read The Notebook or watched the movie starring Rachel McAddams and Ryan Gosling. I hope to see you soon. I know that you just read a book review from me the other day, but hey I am finally in a good place with my reading and that’s great for my goal for this year. It also means that I may have finally gotten out of the reading slump I was in. 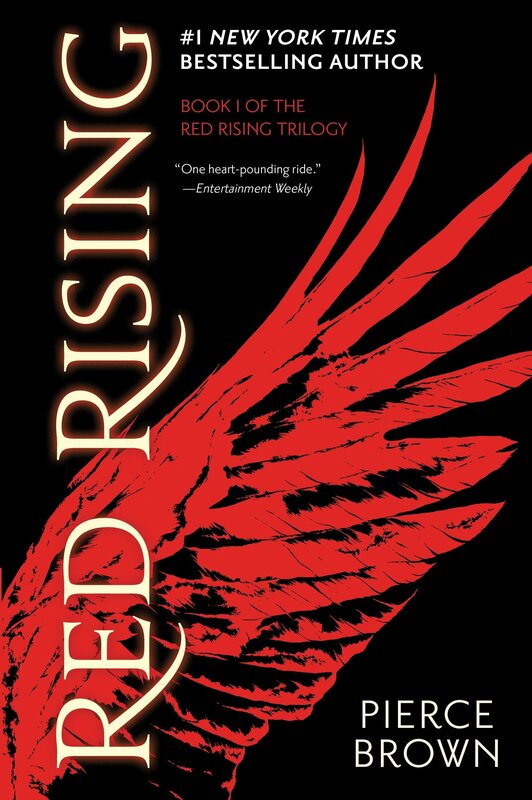 In case you haven’t noticed today’s review is going to be on Red Rising by Pierce Brown. I decided to read this book on the recommendation of Rachel Dawson and it was definitely worth the read. The basic synopsis for the book is that as humans we are now living on Mars and we still have a class system, which is much worse than we have now, in the book we are now divided into classes called by colors. A boy named Darrow is born into the color Red and believes that this will be forever be his life. His wife, Eo has other plans and due to her dreams and hopes for Darrow, it gets her killed. Darrow is nearly killed also, but his Uncle Narol has given him away to the Sons of Ares. The Sons of Ares are a group that has been trying to cause an uprising that will change the fate of the world that Darrow knows. Once taken in by the Sons of Ares Darrow is remade to become a Gold and go to school to learn to become a general of armies. The majority of the book takes place at school in which all the students are divided into armies named after Roman gods and told to conquer, fight, and be the one left standing. After we got through the intro and Darrow was taken into school , I found that the book reminded me quite a bit of the Hunger Games, in which there can only be one Primus/ winner and that person will get the ultimate prize. I can give you a few clues on how the story ends since this is book one in a series. I would also like to say that I am planning on continuing the series, just to see what happens to Darrow in the end. It took me a long time to read the book partially because I was in a reading slump and partly because I found the book moved slowly and that I wasn’t engaging that much with Darrow until we entered the school. I nearly DNF’d the book, but decided since I was already that far I might as well finish the book. I’m glad that I did and now I need to know what happens to Darrow and the rest of the Reds. Let me know what you are reading and if you have read the series. I hope to have a few more interesting post coming for you in the next couple of weeks.